Lieutenant General James Rupert Everard CBE is to be the Commander Land Forces from September 2014. He was born 1962 and commissioned into the 17th/21st Lancers in June 1983. In 1995, as Chief of Staff, 4th Armoured Brigade, deployed to the UN Protection Force HQ, Sector South-West, subsequently as part of the leading UK element of the NATO Implementation Force (IFOR) in Bosnia. Military Assistant to the Commander of the Kosovo Force (KFOR), 1995. Commanding Officer of the Queen's Royal Lancers 2000. Deployed as part of UN Peacekeeping Force in Cyprus. Commander of 20th Armoured Brigade 2005. Deployed to Basra. 20AB relocated November 2006 to Paderborn, Germany. Appointed Director Commitments at Land Command 2007, General Officer Commanding 3rd (UK) Division 2009, Assistant Chief of the General Staff 2011. Deputy Chief of the Defence Staff (Military Strategy and Operations) March 2013. Awarded the QCVS November 1996, OBE April 2000, CBE June 2005, a second QCVS July 2007 for his work commanding 20AB during Op Telic 8. Forum patron, Army LGBT. President of The Queens Royal Lancers Veterans (East Midlands Branch) Committee. Trustee of The Tank Museum, Bovington, Dorset. Major General Everard has made several recent media appearances in response to high-profile Army controversies. In August 2012, following an audit of dead soldiers' body parts dating from 2002 that revealed some parts had been retained without the families' permission, he gave assurances that a full investigation would take place and the families would be consulted about the eventual fate of the tissue samples. 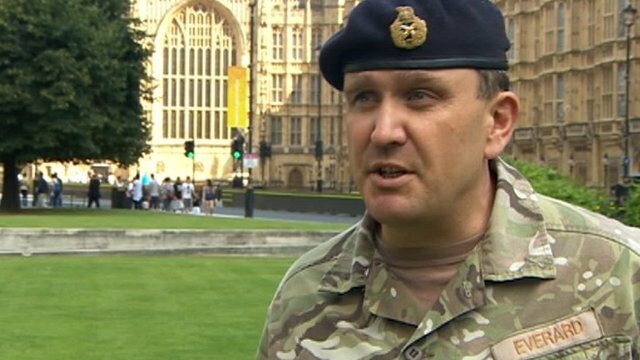 In January 2012, Everard told The Telegraph that the latest round of redundancies would be 'as painless as possible', and in January 2013, he stated that the Army 'can cope' with its newly reduced numbers. "It is mission accomplished," he said. "In terms of creating the security apparatus, I think that you can say that that has been largely completed, recognising the shortfalls I have talked about and those areas which we will continue to have to polish. In terms of the security structures � job well done." Tory MP James Gray said: "Are you just giving us the director of staff solution, it's all going jolly well, please carry on sergeant-major?" Tory MP Adam Holloway, former Grenadier Guard, said: "Don't [big lessons] lie somewhere around massive over-optimism and lack of honesty by senior commanders ?"